This recipe for Chili Con Carne is a hearty meal that is great for large groups or even football games. I like making several ahead and freezing them so I have a good, stick-with-you meal whenever it’s needed. Serve with some tortilla chips, corn bread, or tortillas. Enjoy! Cook ground beef, onion, green pepper, and garlic until meat is browned. Drain off any fat. Stir in remaining ingredients. Cover and simmer about 20 minutes. Cool. Place in gallon freezer bags and freeze. Thaw completely, simmer until heated through and serve. 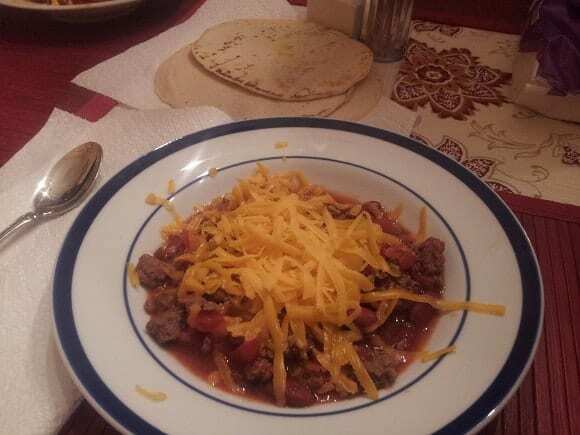 Top Chili Con Carne with grated cheese, sour cream, chopped onions, or any other favorite condiments. Ryloo and Glory. Be sure to stop by, say hi, and enter some of her giveaways! This looks delicious! I am adding it to my bookmarks for fall/winter dinners!